These should be allocated prior to May 2, 2016 at noon EST. The Plus and Apex allocations will be released on May 7, 2016. Last month’s TSPi Basic performance was 1.2%. 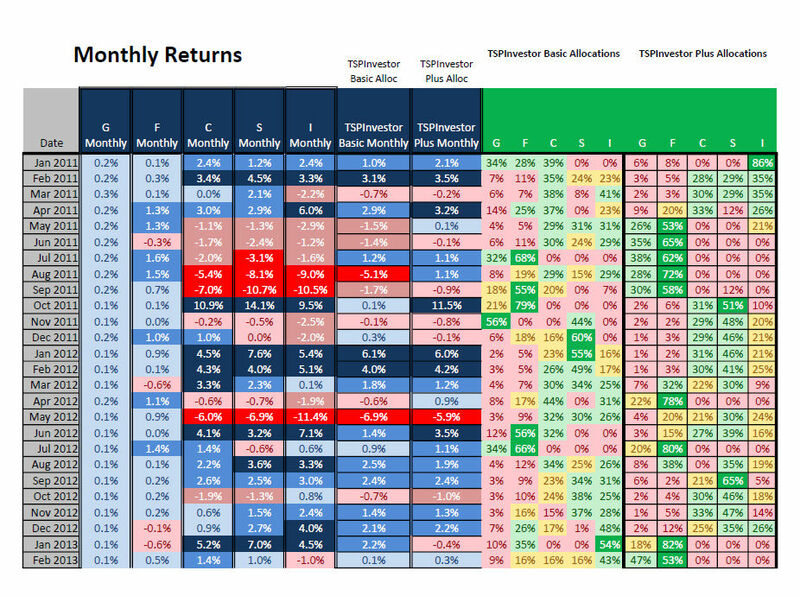 Most days I’ll update this page to include the latest returns for the TSPi allocations (TSPi Basic, TSPi Plus and TSPi Apex), TSP funds and other investment strategies. Information includes returns from: Yesterday (the last TSP business day); This Week which will also show “Last Week” on Monday; This Month; Last 30 Days; Last 60 Days and Since 1 Nov 2015 (when TSPi started). 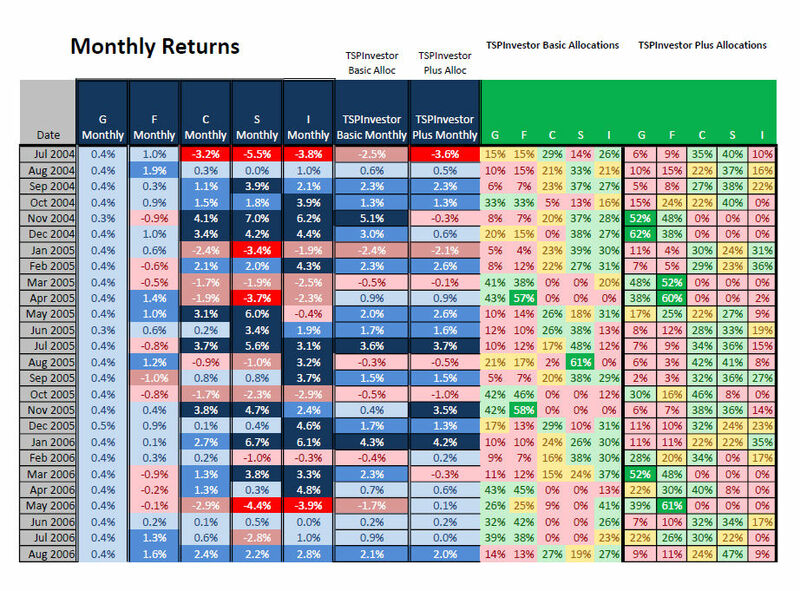 Returns from the TSP G Fund, F Fund, C Fund, S Fund and I Fund are shown. 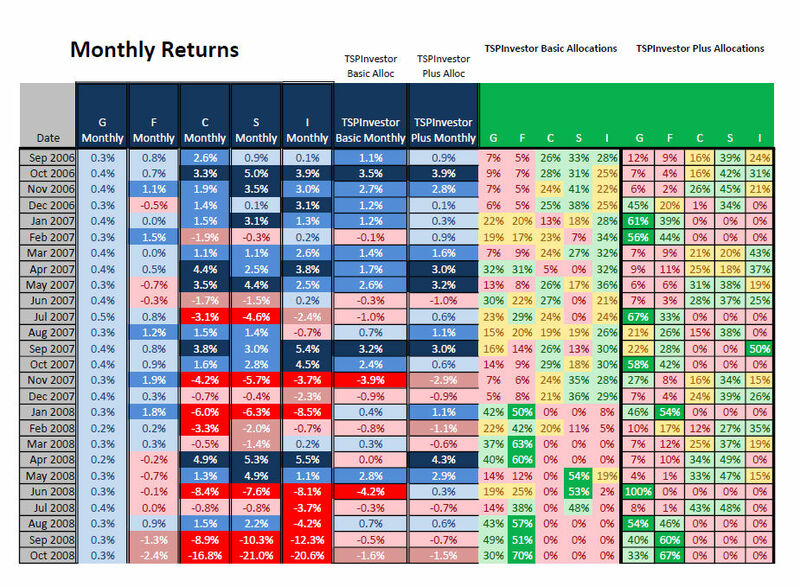 Returns from the 50CS, CSI, C20, CF, SF, and PF allocation strategies are shown. Allocations are also shown. Bookmark this page to have quick access to the information. This was the highest monthly return for the stocks in quite some time. The C had 7.4% and I had 3.5% in Sep 2013; the S had 7.0% in Oct 2011. So the TSP Basic has no confidence the market will continue to gain in November 2015 and has most of the investment in G and F funds. The TSPInvestor Basic has shown a nominal 12% annual return on its monthly allocations, that are based upon historical fund data only. To implement this allocation, login to your account and change the fund allocations (via interfund transfer) and your new contributions to the recommended percentage. These usually take effect the next business day. These allocations are meant to be done on the last business day prior to the 2nd of the month. NOTE: This was originally published on the 31st of October as a page .. I have copied it to here so it will appear as a blog post. The TSPinvestor Plus is a nominal 19% annual return. It is allocated the last business day before the 10th of the month. This is the first allocation recommendation ever done for the Plus. I do have historical data and allocations that show the Plus has great potential. 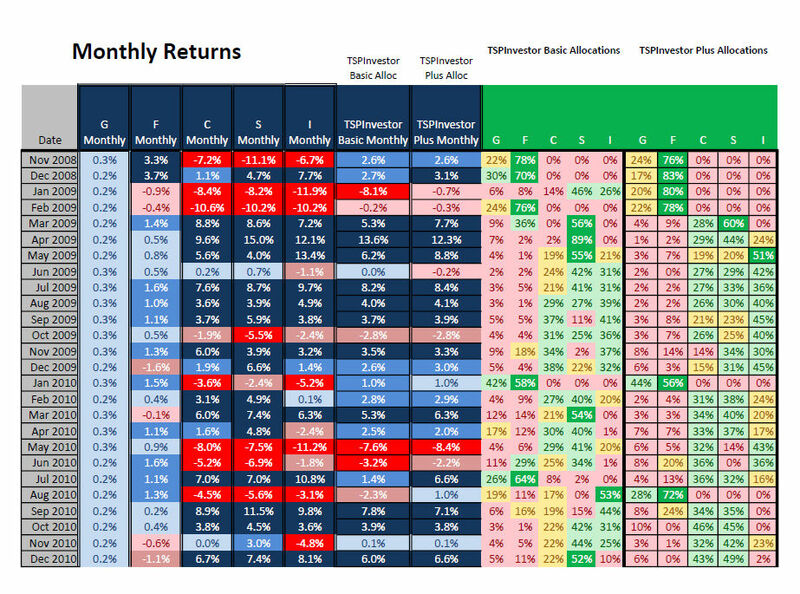 But until it is shown here, recommending an allocation and then realizing the returns, it remains unproven. Had a recommendation been done last month, it would’ve been 5% G, 13% F, 27% C, 55% S and 0% I. 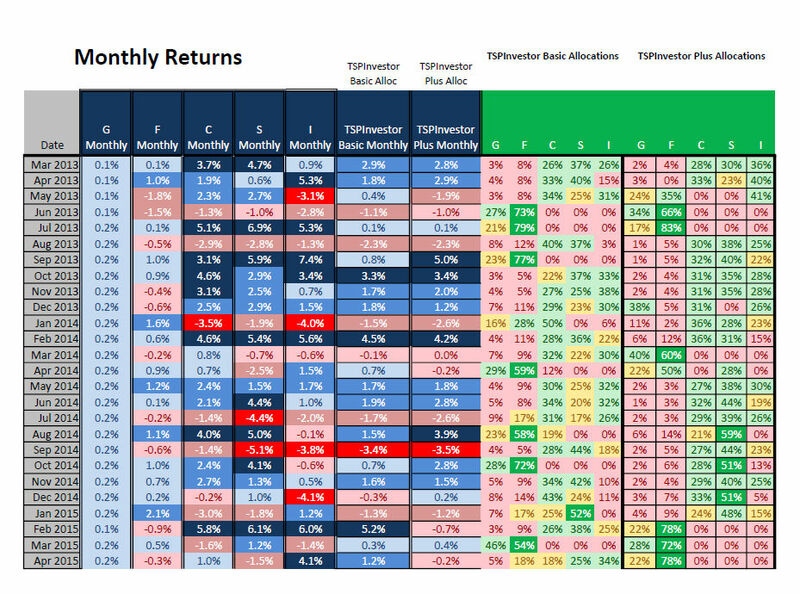 The returns since the 9th of last month were G 0.2%; F (0.7); C 4.4%; S 2.5%; I (0.2) with negatives in parenthesis. This would’ve resulted in the TSPinvestor Plus return of 2.5%.